We are delighted to release the details of our annual festival on Sunday June 5th in Castlebar, This year we are renaming Dancing At The Crossroads, Ceol At The Crossroads!! We had huge interest from local bands, especially young local, original talent who will be putting on a showcase of music, original songs, rap and more with all performers coming from the area. 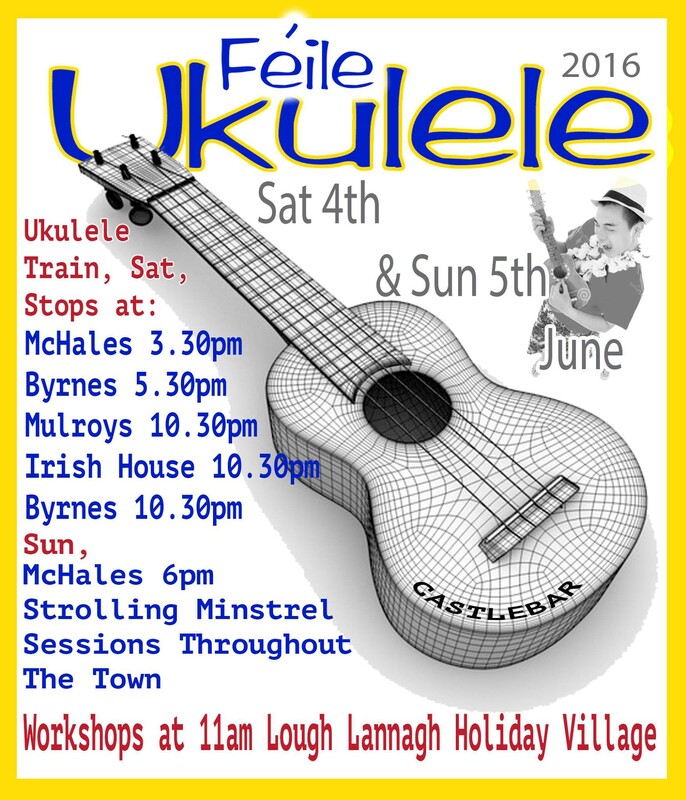 After the success of Castlebar Live! 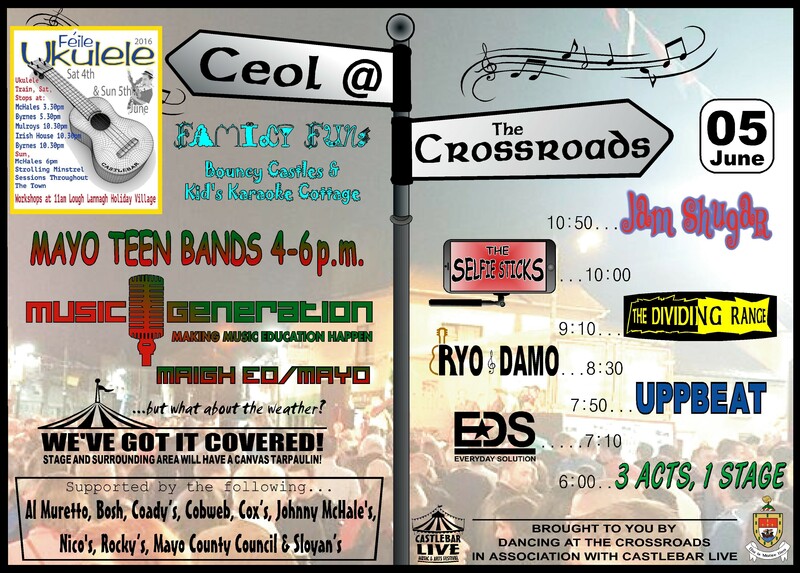 and Mayo Day, so much local talent emerged and it was decided to dedicate June 5th to provide a stage for them and host CEOL AT THE CROSSROADS. For the last 5 years we had a hugely successful festival on the streets of Castlebar and we will host our event again in the same spot as the last few years and feel this will attract thousands to the town. Linenhall St. and Tucker St. will be closed off from 12pm till midnight. Music Generation Mayo's (MGM) Teen Bands will start the live music at 4pm. This will feature all students of MGM under the direction of Kate McKeon. After that local musicians including Aidan Bolger, Julianne Hennelly, Dean Cleary & Thomas Langan will be sharing the stage for "1 stage, 3 acts". Everyday Solution, the 5 piece pop act will be producing professional noise, amateur style. Fionn Costello will be making his debut appearance in Castlebar with his full band, UPPBEAT. Finn has attracted the attention of rappers in Brooklyn so these lads are not to be missed! The maestros of acoustic rock 'n' roll, rhythm & blues, reggae and soul, Ryo & Damo will be there along with The Dividing Range, a 3 piece band with a range from folk to indie rock, focusing on recording original material and now are bursting on to the Irish music scene. The Castlebar based Selfie Sticks, a 4-piece original rock band are up next and well known Jam Shugar will finish the night playing all your favourite rocking anthems from 60's classics to modern favourites with a few original tunes to spice it up. This is a huge night of home grown local talent so come out and support it and this year you don't have to worry about the rain as there will be a specially constructed "stretch tent' covering the stage and front of stage area so you can dance away without worrying about getting wet!! The cover will be lit in cool lighting effects so we've got everything covered!! Later that day, (Sunday), the ukulele bus will head for Johnny McHales at 5pm and there will be an all-inclusive session there. All students are invited to join in the fun. Later that night the "The Strolling Ukulele Minstrels" will wander around various venues in the town taking over the premises for a few songs before heading off on their journey again. Make sure to put the date in your diary for this fantastic fun festival! !